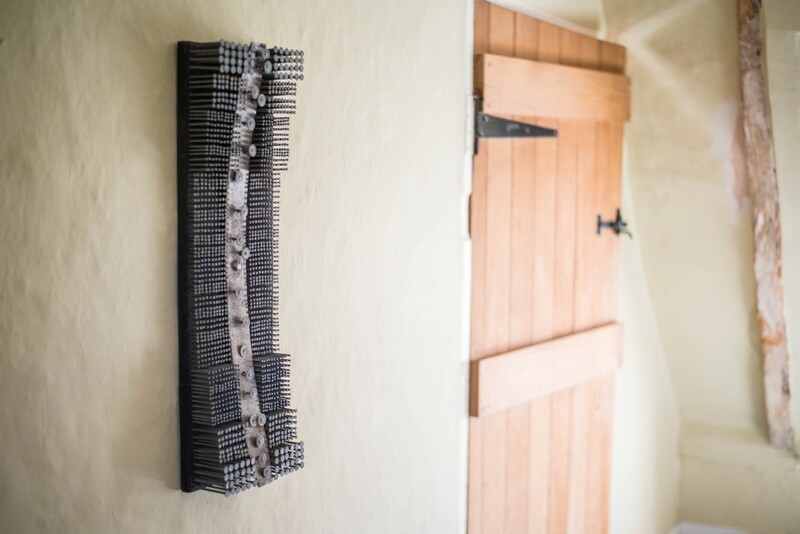 Cataloguing the (rather Marmite) nail sculpture by David Gerry Partridge recently, its stark, cold nature reminded me of a little sculpture that we had the pleasure of handling a couple of years ago. It was that classic Only Fools and Horses moment where Del Boy sells the watch at auction and becomes the ‘millionaire’ he has always promised he would be! It is not often that an absolute gem of a find is plopped into your lap unexpectedly, but I suppose in our business, it is what we all wish for. Most of us have that urge to play art detective and find that elusive sleeper. I am not sure what triggers the alrm bells – experience, a mind stuffed full of useless information perhaps, but take it from me, there is something that hones in on the gem within a box full of rubbish. It was a day like any other day. A regular meeting with an old client. A casual chat through things over a cup of tea. Bemoaning the children knocking off a small metal sculpture from the mantelpiece, picking it up, brushing it off and replacing it. Hold on a moment….rewind….that looks familiar…. ‘Bought today May 5th Chadwick’s Human Eye. £12-12-0. Just managed, pinching a bit: I mortgage the future out of love for it. To find it for sale – like a girl unmarried. To play and reflect in the flirtation. And then mine to live with forever… and I think happily of how I shall sit and watch the light spin the crystal held in the claws’. Both the diary and receipt had been kept by the family and from his words you see how intensely he felt for the piece and how much his finances had been stretched in his desire for its acquisition. 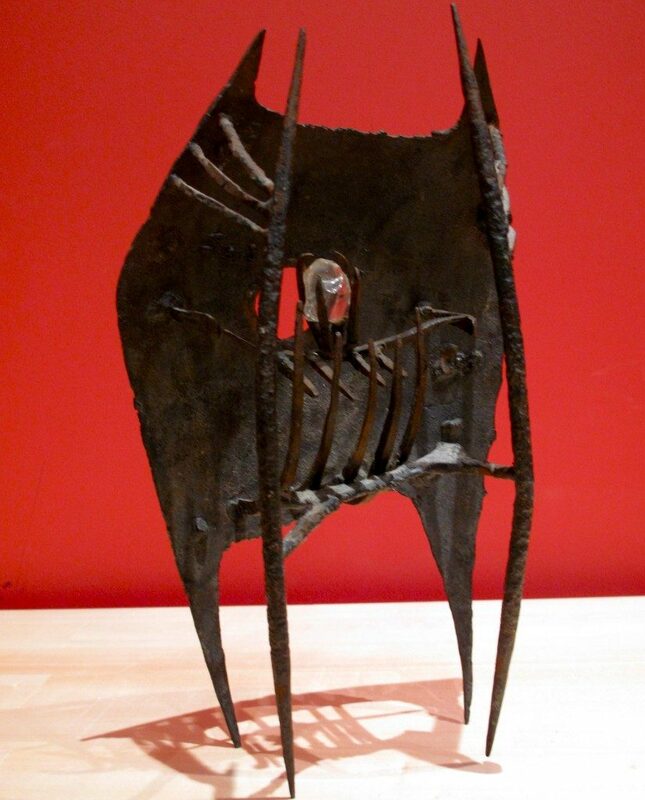 Lynn Chadwick, R.A. (1914 – 2003) was part of the post-war new wave of British sculptors led by Dame Barbara Hepworth and Henry Moore. His interest was born out of visions of the nuclear age, the Cold War and the threat of the bomb. His output was prolific and in the last two decades the revival of interest in his work had been substantial. Good news for us then! Chadwick’s widow Eva and Dr Dennis Farr CBE, former director of the Courtauld Institute Galleries had produced, in 2006, a complete illustrated catalogue of Chadwick’s work. It seemed this sculpture, standing at only 20cm came from a group related to the Inner Eye of 1952 (the Museum of Modern Art, New York). A monumental peace standing at well over 2m high. Chadwick produced a series of five ‘Maquettes’ prior to the physically massive versions. They were all similar in construction. A four-legged jagged iron framework enclosing a rough lump of clear glass protected by what appears to be ribs and a welded iron shield. The glass, which can be turned, is viewed through a central hole in the shield. The catalogue noted Maquettes II, III, IV and V with images and references to their known locations. The Museum of Modern Art in New York, the Tate in London, the Chadwick family collection and a private collection (purchased from Christies in 2007). However, Maquette I was only referenced with a simple illustration and a note of its exhibition at Gimpel and Fils, London in June 1952. There was no image and no known location for it. By comparing our sculpture with the illustration, we were convinced we had Maquette I but it needed authentication from Chadwick experts. This was eventually obtained nearly 4 months later. Setting price expectations with a client who thought something had little value is a precarious challenge. Managing expectations (and a premature spending spree) meant we needed to be conservative with the figures. We knew that Maquette IV had sold in 2007 for £270,000 but had no idea how the market today would react. It was agreed to use Sotheby’s to conduct the sale and it appeared at the Modern and Post-war British Art sale on 11 July 2013 where, against an estimate of £200,000-£300,000, it sold in the room to a dealer for £380,000 hammer. A great result and one very happy client! I was never particularly enamoured with the piece myself. It made me feel fearful and uncomfortable – perhaps that was its intention. Afterwards, over a well earned G&T, the client reflected on how she considered her relative to be a gentleman of impeccable taste but how her attachment to the sculpture had diminished and it could easily have ended up in a jumble sale. It transpired the incident with the mantelpiece had been one of many. We have not yet established who the new owner is (that is the missing part of the story, unfortunately for me) but I’m sure it will be safe and well looked after with not a mantelpiece or child in sight! The lesson for us all is to never dismiss any of our little trinkets as valueless. It is always worth asking an independent valuer like Mrs Fox or Fine Art Valuation http://fineartvaluation.com for a valuation. You never know!